VIDEO - "The quantity of arms seized on the weapons ship Francop is 10 times or even more than the quantity of weapons on the Karin-A ship," said Israel Deputy Navy Chief Brig. Gen. Rani Ben-Yehuda told reporters during a briefing Wednesday at the naval base in Ashdod. 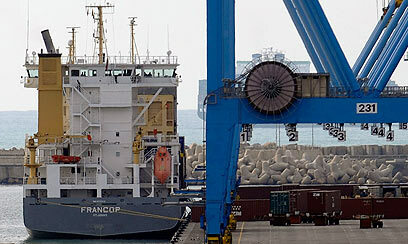 The Francop weapons ship that was seized off of Cyprus by Israel Navy commandos was brought into Ashdod Port. According to Brig. Gen. Ben-Yehuda, the weapons were hidden in dozens of containers with a collective weight registering in at hundreds of tons. The weapons included enough ammunition and missiles to supply Hezbollah for a month or more of fighting against Israel, he said. Navy sources said the ship carried more than 3,000 shells and missiles. During the briefing, Tuesday night's dramatic events that took place some 180 km (about 110 miles) off of Israel's shores were reconstructed. The Israel Navy force reached the cargo ship sailing under an Antiguan flag Tuesday night and asked to perform a routine questioning that is periodically carried out in addition to an examination of the cargo. The captain gave the go-ahead. Members of the Commando 13 force started to check the ship, which, according to Brig. Gen. Ben-Yehuda, is of German origin, under the patrol of Israeli missile boats. The ship's documentation was also checked, raising suspicions because the ship's cargo was listed as being loaded in Egypt and destined for Syria. The goods were carried in containers from the Iranian merchant fleet. An examination of the containers revealed that they were carrying weapons. Brig. Gen. Ben-Yehuda did not address whether the operation was a result of prior intelligence, and said that any ship suspected of carrying Iranian cargo is checked, sometimes by the Israeli Navy and sometimes by other Western forces. After finding the weapons, the Israeli Navy notified the relevant officials that it was rerouting the ship to Ashdod Port for a thorough examination. Out of the 400 containers on the ship, 36 contained weapons. The lift destined for Hezbollah was hidden among thousands of white polyethylene bags. The weight of each bag was about 25 kg (55 lbs). Boxes contained 106 mm shells, rockets 107 mm and 122 mm in diameter, hand grenades, mortar shells, anti-tank missiles, and ammunition for Kalashnikov rifles. "We are certain that the crew did not know anything, and even that the Egyptians did not know what was loaded on board," said Brig. Gen. Ben-Yehuda. "What is certain is that this ship was in various locations and endangered the lives of the people who did not know that there were weapons on board, but innocently believed that it was a regular civilian container." According to him, "Iran has again proved that it mocks international law and the UN Security Council that forbid it from sending weapons to other countries." Ben-Yehuda also noted that the only purpose for these weapons was to target the civilian population and increase terrorism. The ship's crew, including sailors from Poland, the Ukraine, and the Far East currently is remaining on the ship's deck. The crew was shocked when they learned that massive quantities of weaponry were hidden in the polyethylene bags. The IDF intends to release the ship and the crew after it finishes checking all of the suspicious containers and the rest of the ship. 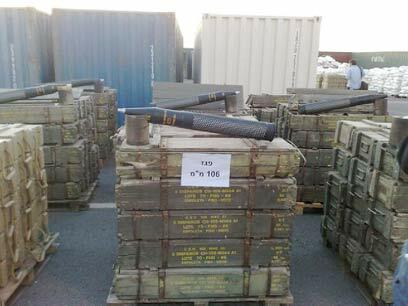 Defense Minister Ehud Barak said about the weapons ship seized near Cyprus: "Tonight we seized a ship that smuggled arms to the terrorist zone in the south. Iran, via its proxies Hamas, Hezbollah, and others, is trying to hurt the heart of the civilian population in Israel." In a memorial ceremony for slain Prime Minister Yitzhak Rabin on Mount Herzl, Barak praised the IDF's branches, fighters, and commanders for the success of the operation that seized the weapons. "With what we know of the arena, there will be more attempts (to smuggle weapons), and we must invest efforts to thwart them. At night, we dealt with thwarting (arms smuggling), and in the morning we continue our efforts to achieve peace." A short time after the ship was seized, military officials estimated that the quantity of weapons on the ship exceeded the quantity seized on the Karin-A, though the full extent was only revealed later. Estimates are that the weapons are Iranian and were bound for Hezbollah in Lebanon. The ship was on its way from Egypt to Syria and planned to anchor on the way for the weekend in Lebanon. Prime Minister Benjamin Netanyahu also praised the efforts that led to the ships seizure. Speaking in Tehran during a joint press conference with his Iranian counterpart Manouchehr Mottaki, Moallem added, "The ship was carrying goods to Syria, not Iranian arms. There was no equipment aboard the ship meant for the manufacturing of weapons in Syria." See all talkbacks "Navy: 10 times more arms on ship than on Karin-A"